When deciding when to visit Spain, May is a great choice all around: excellent weather, smaller crowds, and plenty of exciting events and activities all across the country. However, knowing where to go and when can be difficult, especially since Spain has so many celebrations happening in multiple fabulous cities all throughout the month. If culture and authentic celebrations are what you seek, look no further. Cities and entire regions throughout Spain get swept up in local festivities throughout May, from the colorful ferias of Andalusia to the street parties that rage throughout Madrid in celebration of San Isidro. Music lovers, of course, will want to keep festivals like Barcelona's Primavera Sound and the WOMAD event in Cáceres on their radar. Basically, no matter where you go, there's bound to be a party to kick off summer season early. No matter which destination is on your radar, knowing what's happening will help you better plan the perfect vacation to Spain. Colorful Córdoba is one of Europe's hottest cities, so coming a bit before the height of summer is a good idea. While often relegated to a day trip from big sister Seville a little ways west, Córdoba has plenty to see and do throughout the year, but May is essentially one nonstop party in the ciudad califal. Another festival begins seemingly as soon as the previous one ends, giving the city a vibrant, boisterous atmosphere all month long. Here's what's going on throughout May in Córdoba. Cruces de Mayo (May 1–5, 2019): Plazas and other corners throughout the city will play host to gigantic floral crosses, festive music, and bars, with the festivities often lasting late into the evening. Batalla de las Flores (May 5, 2019): A colorful floral-themed parade that sees elegantly dressed women in flamenco garb riding on extravagant floats throughout the city and tossing flower petals to the spectators. Patios Festival (May 6–19, 2019): Private courtyards around town open their doors to the public in order to show off their stunning floral decor. Prizes are awarded to the best-decorated patios. Feria de Córdoba (May 25-June 1, 2019): The biggest and best party of the springtime, Córdoba's annual fair is a week characterized by traditional food, music and dancing with plenty of flamenco flair. Spain's happening capital is an ideal destination at any time of year. However, as spring enters into full swing in May, so do the local festivities. Throw in the fact that there will be fewer tourist crowds than in the summer months, and you've got all the makings of a perfect trip. Here's what's going on in Madrid in May. The Dos de Mayo Festival (May 2): This festival commemorates Madrid's victory over Napoleon's armies in the early 19th century. Expect extravagant military displays, concerts, sporting events and more throughout the city. Madrid Open (May 3–12, 2019): Tennis fans won't want to miss the country's biggest tournament. Documenta Madrid (May 9–19, 2019): Madrid's premier documentary film festival is a must for film buffs, as well as anyone who wants to expand their knowledge through cinema. San Isidro Festival (May 10–15, 2019): A massive party thrown in honor of the city's patron saint. Many locals make a pilgrimage out to the St. Isidro Hermitage out in the eponymous park, but there's plenty going on throughout the heart of the city as well. Madrid's biggest competition in terms of popularity is Barcelona, but which is better for you really depends on what you want out of your vacation to Spain—even if it's an off-the-beaten-path adventure. While Madrid is the country's thriving capital, Barcelona is the country's most celebratory city year-round, but especially in May when the city plays host to dozens of special events. There are also several great day trips from Barcelona, so be sure to plan extra time to explore the region while you're there. 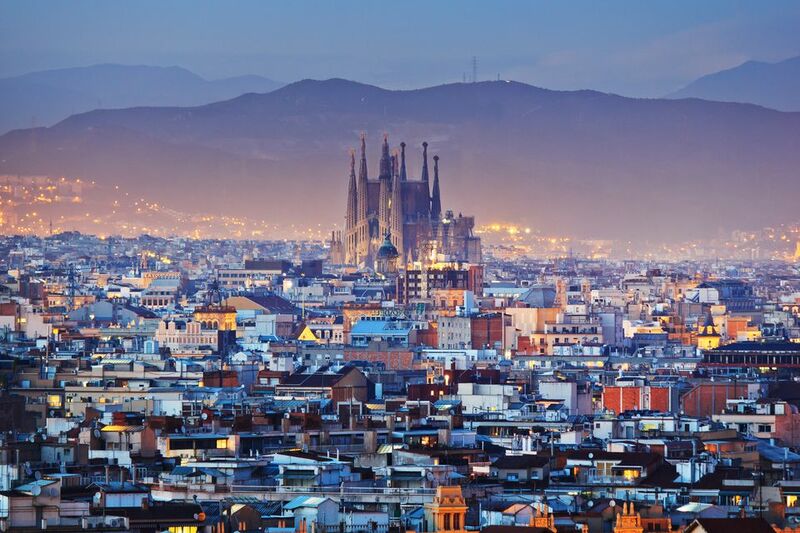 If you'll be Barcelona bound this May, here's what to add to your agenda. Spanish Formula One Grand Prix (May 10–12, 2019): Racing fans, this one's for you. Don't miss your chance to see one of the most exciting F1 events in Catalonia's vibrant capital. Girona Flower Festival (May 11–19, 2019): The nearby city of Girona springs into full bloom with this colorful floral fest, which sees extravagant botanical displays all over the city. Primavera Sound (May 30-June 1, 2019): Barcelona's most iconic music festival will play host to the likes of Cardi B, J Balvin, Janelle Monáe and other household names this year. The Western Spanish city of Cáceres may not be on every tourist's radar just yet, but that's exactly why we love it. Home to the Museum of Computer History, a breathtaking Old Town, stunning natural beauty at Monfrague Natural Park and so much more, it's the best Spanish destination you've never heard of—yet. This small but happening city also hosts its fair share of can't-miss events in May. Here's what should be on your agenda if you're headed to Cáceres. Feria Nacional del Queso (May 1–5, 2019): Yes, you read that right. Extremadura's legendary annual cheese fair takes place in nearby Trujillo in early May. WOMAD Music Festival (May 9–12, 2019): A celebration of global art and music, this is the must-see event taking place in Cáceres in May. Come for the music, stay for the multicultural sense of community. Much like nearby Córdoba, Seville gets extremely high temperatures in the summer and is considered one of the hottest cities in Europe. As a result, May is one of the best and most popular times to visit this southern Spanish city. If you're heading to Seville in May, here's what you won't want to miss. Feria de Abril (May 5–12, 2019): Despite its name, Seville's legendary "April Fair" will take place entirely in May this year due to the late date of Semana Santa. More than 4 million guests flock to the Andalusian capital for this iconic event every year.